Demotix/ Michael Debets. All rights reserved. In an unheralded committee room at the House of Lords on Wednesday (April 12) a group of politicians from across the political spectrum came together with the participants and organisers of two recent pilot Citizens’ Assemblies on constitutional reform. It was heartening to hear the genuine appetite for new approaches to involving members of the public in politics. Politicians from the Conservatives, Greens, Labour, Liberal Democrats, Plaid Cymru, SNP and UKIP all sang the praises of the Citizens’ Assemblies and called for more public participation in politics. Nevertheless, belying this consensus was a little less agreement than apparent at first sight. The two citizens’ assemblies – Assembly North in Sheffield and Assembly South in Southampton – provided a chance for a small group of ordinary members of the public to engage in structured deliberation on the hot topic of local and regional devolution. In addition, they were an attempt to demonstrate the value of citizen participation on even complex matters of policy. The topic of conversation yesterday was the new report on this experience, Democracy Matters. One of the fascinating things about listening to the different politicians responding to the Assemblies was just how differently they framed what the Assemblies were about, as well as what more of this kind of participation could achieve in the future. Much of my research has considered the different ways that we frame the idea of public participation. In particular it examines how these frames are related to different conceptions of democracy and public administration, and it seemed as though the alternative ways the Assemblies were framed were linked to the politicians’ differing views about the broader political system. For Dominic Grieve (Conservative) the Assemblies were important for politicians in taking stock of informed public opinion. They were contrasted to the snap judgements that are captured by opinion polling and the constituency letters that MPs receive, which are difficult to give a lot of weight to given the unrepresentativeness of those who write them. In this view the Assemblies were akin to the Deliberative Polling that James Fishkin has popularised. They provide information, but politicians retain the right to use that information how they see fit in making policy decisions. For Graham Allen (Labour) and Caroline Lucas (Green Party) the Assemblies were one component in creating something approaching a social movement around constitutional reform. As Caroline Lucas put it, participation is not about giving power but enabling people to take power. The aim was to build bottom-up pressure in order to drive into action a sclerotic political system that has failed to reform and is fast approaching a crisis of legitimacy. In contrast, for Lord Tyler (Liberal Democrat) the Citizens’ Assemblies were more of an opportunity for politicians and citizens to work collaboratively together to solve a pragmatic problem of politics that has so far proved intractable. Each of these frames are quite different from that which characterised the British Columbia Citizens’ Assembly on electoral reform, which provides a mirror to our English counterparts. In British Columbia citizens were tasked with solving the problem independently of politicians, precisely because political parties’ vested interest in a voting system that most benefited them had rendered the problem intractable in the legislature. The Assembly produced recommendations that were then voted on by citizens in a referendum. The way that citizen participation initiatives interact with elected representatives in large part determines how successfully they influence the policy process. Yet each of these four frames entails quite a different model for thinking about that interaction. In the first case politicians don’t take part in discussion, but they can be trusted to listen carefully to the outcomes and weigh up this information alongside all the other relevant information when making their decisions. In the second case perhaps some vanguard politicians get involved with the public, but the public is placed in an oppositional relation to the majority of politicians that make up the status quo. They don’t trust them to act, they force them too. 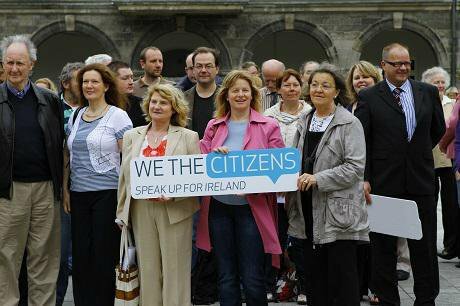 In the third case, citizens and politicians engage on equal terms to work collaboratively together in the same space. In the fourth case, the relationship with politicians is to some extent incidental since citizens are given the responsibility and power to independently solve the problem. There are perhaps two paths that this disagreement underneath the consensus could take. One path is optimistic. The consensus that democracy matters will prove a strong enough glue to drive further participation efforts. Deliberative democrats have become increasingly attentive to how ‘incompletely theorised agreements’ (when people agree on something for different reasons) can facilitate collaboration in spite of difference. The other path is pessimistic. Disagreements about exactly how democracy matters will scupper any cross-party attempts to create a more participatory politics. Plans for participatory initiatives will founder on the drawing board due to disagreement about what that participation should look like, or will instead resemble the proverbial camel. The challenge for all those who attended the Democracy Matters meeting yesterday is to ensure that it is the first path that is taken.